We are Whale Parts Direct and we are registered in England with Company number 04251423. Our VAT number is 849745079. Our trading address is Whale Tankers Ltd, Ravenshaw, Solihull, West Midlands, B91 2SU. You must provide full and accurate payment details (e.g. credit card, debit card, Via Sage Pay) at the point of submitting your order. We will take payment from your credit card, debit card Via Sage Pay account as soon as you place your order. We currently accept VISA, MasterCard, Visa Electron and Sage Pay. We aim to deliver your products by the estimated delivery date set out in the confirmation email or, in the case of pre-ordered Products, we will contact supplier to obtain an estimated delivery time. Whale Parts will then contact you to discuss this and confirm acceptance. If we are unable to meet the estimated delivery date because of an event outside our reasonable control we will contact you to discuss a revised estimated delivery date. If you have paid for a special or upgraded delivery such as a pre 9:30am, and expectations are not met, please call the parts team on 0121 704 5720 to discuss and resolve this. ​Delivery will be completed when we deliver the products to the delivery address given on the order. Please Make Sure When Signing For Goods That They Are Not Damaged And In Working Order. We aim to deliver all stocked items next working day. All orders must be placed by 4:30pm Mon-Thurs and by 3:30pm on Friday 10:30am Saturdays to meet the carrier for next working day delivery. Other delivery options are available such as AM, Noon and Saturday but will incur a premium cost. Please see our delivery options for more information on delivery options and costs. If you are situated or working local to our destination, Whale Parts team are always happy to see and assist our customers over the trade counter with purchased parts and enquiries. 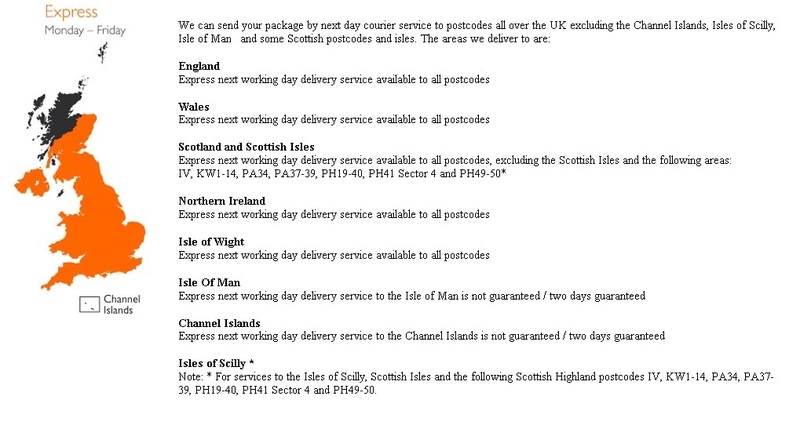 Deliveries for our Express National Services exclude the Channel Islands, Isles of Scilly, Isle of Man, certain Scottish postcodes and Scottish Islands. Next day delivery is only available for shipments collected within normal business hours. We will deliver your shipments on the next working day, at any time up to 5pm, unless one of our time-definite, next working morning, or Saturday delivery services is requested. Shipments for the Channel Islands will be delivered at any time up to 5pm, within 2 working days. ​​Whale Parts Direct delivers to destinations outside the UK. However there are restrictions on some products for certain countries for further information please call the parts team on 0121 704 5720. ​​Delivery outside the EU may be subject to local import duties, custom duties or taxes which are your responsibility where they apply. Unfortunately we cannot advise you what these charges will be and Whale Parts Direct is not responsible for them. If you have purchased any items and want International delivery then please give us a ring on 0121 704 5720 to discuss best form of delivery and to calculate a delivery cost. Any product purchased from whalepartsdirect.com, that is a stocked item at our warehouse, can be returned within 14 days. The products should also be returned with their original box, packing, accessories, and any additional items. Any product that has been specially ordered in or manufactured (A Non-Stocked item) will NOT be accepted for credit or a refund. If the return is required due to missing or faulty parts then we will offer a full refund or replacement. Providing that we are aware of this within 7 working days of the dispatch date. All Card Transactions Are Secured By SagePay.